WordPress has evolved substantially from its early days as a simple and user friendly blogging platform. Nowadays, WordPress sites account for about 28% of the web, and represent everything from powerful eCommerce platforms to complicated membership sites. We’ve implemented user forums, location finder maps, location-specific multisites, events management, donation forms, image and video galleries, hundreds of ecommerce and membership sites, and piggybacked on the developer-friendly and robust WordPress architecture to design more custom features than we could possibly keep count of. We’ve recently worked with a number of clients who required a learning management system (LMS) for their organization. Traditionally, learning management systems have been implemented using either an expensive off the shelf piece of dedicated software such as Blackboard or Skillsoft, or the popular open source LMS Moodle. Though the dedicated software options are usually very powerful, they come with an extremely hefty price tag for the license, as well as even larger costs for any ongoing support or customization. Furthermore, integrating them with WordPress, or any other content management system can be a difficult undertaking. Moodle is an LMS we have worked with extensively in the past, and we love its open source nature and the active developer and user community around the project. Unfortunately, it is simply not very user friendly top to bottom, including a confusing student interface, an even more confusing administrator interface, and a difficult to customize code base when compared to WordPress. Thankfully, in the last few years a number of excellent WordPress learning management system plugins have emerged. There is really no limitation to what WordPress is capable of in this arena, and these plugins make that abundantly clear with their rapidly growing and impressive client lists (Dow, Department of Defense, CNN, Rutgers, Verizon Wireless, etc.) and the ever expanding list of features available out of the box. 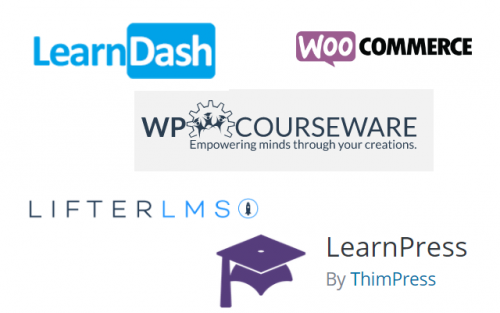 The number of learning management systems for WordPress seems to grow by the day, but the ‘big five’ that we recommend you consider as of this writing are: LearnDash, Sensei (from the makers of the popular WooCommerce ecommerce platform), WP Courseware, LearnPress, and LifterLMS. The initial costs of these robust platforms range from free for basic options only, to the mid hundreds for ‘the works’ with all add ons. After much research including direct communication with the plugin developers, we have found LearnDash to be our personal favorite for a variety of reasons. First and foremost, it is very powerful out of the box, with a long list of customizable features such as multi-tier courses, user and course forums, and membership and course sales. Just as importantly, the support is fantastic and the plugin is easy to customize. We have built up a number of sites now based on LearnDash and have thus far been very impressed, but the other options listed above all are solid choices and have their own list of pros and cons. If you need a learning management system for your new or existing WordPress site and don’t want to break the bank on a Blackboard or similar license, or face the headaches of customizing and integrating a Moodle installation, look no further than one of the plugins above. You’ll be able to seamlessly fold the system into the WordPress platform you already know and love, without sacrificing features or customizability. Contact us to discuss your specific requirements and we’ll help you find the best solution for your unique needs.